On Thursday, September 28, the Pennsylvania Supreme Court released its ruling that will enable the William Penn School District to have its day in Commonwealth Court regarding the equitable funding of public schools in the state of Pennsylvania. 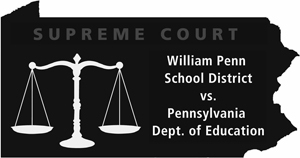 In November 2014, the William Penn School District and other districts and groups filed a lawsuit accusing state officials of violating the Education and Equal Protection clauses of the state constitution by underfunding low-income school districts to the extent that students there could not meet state standards set by the Legislature (A Google search for “William Penn vs. PDE” will offer more background on the case). Initially, the lower court ruled that the matter was not judicable, as it was a legislative issue. The WPSD and other plaintiffs then asked the Pennsylvania Supreme Court to hear the case. On September 13, 2016, the Pennsylvania Supreme Court heard our oral arguments in the case of William Penn School District, et. al. v. Pennsylvania Department of Education, et. al. This Supreme Court case was not to determine whether Pennsylvania’s educational funding method violates the state constitution. Instead, it was to determine whether the courts are a suitable place to determine the constitutionality of the state’s current system of education funding. We now await our court date to go back to Commonwealth Court. Our lawyers at the Education Law Center and the Public Interest Law Center, who are handling the case pro bono, are diligently preparing. We now hope the question of whether the state has failed in its obligation to provide a “thorough and efficient” system of education will be answered by the Commonwealth Court. “The Pennsylvania Supreme Court’s landmark decision today vindicates the principle that adequate and fair school funding is a constitutional mandate, not a political issue. Now that the court has ruled that education funding is subject to judicial review, we hope the governor and Legislature will work with us and our partners to bring Pennsylvania into constitutional compliance by ensuring that every school has adequate resources,” said Michael Churchill, an attorney with the Public Interest Law Center. “We know that we need to invest more in our public schools. The fact is that Pennsylvania is currently 46th in the nation in state funding of public schools and dead last in equity. Working together, lawmakers, educators, taxpayers and concerned citizens can make school funding a priority, give schools the resources they need and give students the education they deserve.” said Dolores McCracken, president of the Pennsylvania State Education Association.